It’s a little hard sometimes to explain how Twitter and blogging can be used together, to compliment each other. I experienced a nice little example of this recently, as part of a discussion I’ve been involved in. The specifics of the subject being discussed in the tweets at left are a bit obscure to anyone outside the medical library community (clarification below) — So, disregarding the subject, the point I’m making is simply that the wording I used in the first tweet served as the basis for the title of a blog article by another medical librarian in the discussion, Alisha Miles (@alisha764), in the bottom tweet. 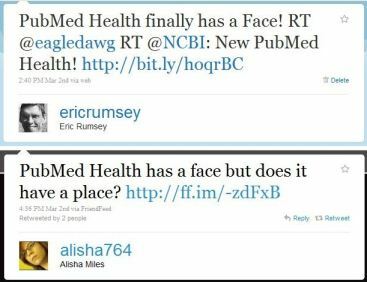 More specifically, in my tweet, about the announcement of the new NLM PubMed Health site, I comment “PubMed Health finally has a Face!” Alisha then responds with a blog article whose title, that’s in her tweet, builds nicely from my tweet — PubMed Health has a face but does it have a place? For more on the specific issues involved in the PubMed Health discussion, so my earlier articles. Posted in Blogging, Twitter, Uncategorized. This was (I assume) seen by Graham Storrs (@graywave) on Twitter, and so he sent in his useful comments to the blog article. Posted in Blogging, PicsNo, Twitter, Uncategorized.